PRODUCT DESCRIPTION: Odorless aerosol or concentrate which can be sprayed on clothing, gear and equipment to keep mosquitoes and other annoying pests away. 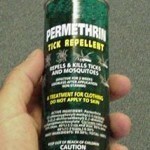 WHERE TO USE IT: Though Permethrin is used for many pests, it has long been known to keep mosquitoes away. 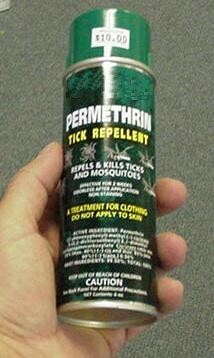 Hunters and out doorsman alike use Permethrin sprayed on boots and pants to keep mosquitoes off when they go afield. But since it's a pyrethroid, most annoying insects do not like it including bed bugs, bees, chiggers, fleas, lice, mites, no-seeums, scorpions, ticks, wasps and gnats. RATE OF APPLICATION: Use the aerosol to lightly cover the areas you want to protect. The concentrate can be mixed with water and applied with a spray bottle as needed.